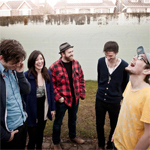 What: Vancouver pop band and one of the rare winners of the “Best New Group” Juno award that were actually a new group– oh wait, that was 2011 and they already had two albums out at that point. NEVER MIND. Why: They released album number three – Little Mountain – at the start of March and while they’ve been touring it all around North America since then, they’re only just making it to Toronto now. Who else: Support comes from coast to coast, as in Chains Of Love from Vancouver and Boxer The Horse from PEI. How: Tickets for the show were $20 in advance but note the past tense – this gig is sold out, so this contest (and others like it) are your only way in, as courtesy of Union Events, I’ve got two pairs of passes to give away. To enter, email me at contests AT chromewaves.net with “I want Said The Whale” in the subject line and your full name in the body. Contest closes at midnight, April 11. What else: Spinner talks to the band, who commissioned videos for every track on the new album; 9 of the 15 are out now. What: Purveyors of effervescent pop with a distinctive west coast accent, which makes sense since the five-piece hail from Vancouver. Why: Their last full-length Islands Disappear came out back in 2009 but they’ve been busy, touring relentlessly and being subjects of the mini-documentary Winning America, which followed them to SXSW this year in attempts to become the next big thing and captured such ups and downs as having all their gear stolen en route to Texas but also winning “New Group Of The Year” at the Juno awards a couple weeks later. KARMA! Who else: Saskatchewan’s Rah Rah and English singer-songwriter Sara Lowes will be warming things up. How: Tickets for the show are $15 in advance but courtesy of Union Events, I’ve got four pairs of passes to give away. To enter, email me at contests AT chromewaves.net with “I want to be winning Said The Whale” in the subject line and your full name in the body. Contest closes at midnight, September 1.